Comfy 2 bedroom condo in the center of Colonia del Valle, just near the tourist and business areas and near the metro and metrobus transportation systems. The living room and dinning room have plenty of space for play, work and enjoy your time, the kitchen is practical and has all you can need during your stay. This area is great for walking, we are near 3 parks, and great places to eat. The condo is next to our house so we can always have a chat, give you our best travel advice. The apartment is in a private condominium, with it's own private entrance, very secure, and the option to have a parking space, additional fee. First you must enter through a main gate and then is the door to your apartment. The condominium is compose of only 4 houses, with wide space. I live next door, so just let me know how can I help you. The garage is the only common space, you can access to it when ever you want. If I'm at home you are welcome to ring the bell and I'll give you access to my yard, it's a nice space to chill out. And if I have time I'll be happy to have tea or coffee and a good conversation. I'm available to help my guest and to give them the best advice for their experience in Mexico City. Where to eat, what to do, how to do it. I'm doing foody tours and visit to different markets. I'm a travel writer, traveling and all the industry related to this activity is my life. I enjoy my work and love to share my experiences. I'm very passionate, and when I set my mind in to something I accomplished it. When I was 18 I said I want to travel all my life and I have done it, I have visited all the continents and more than 45 countries. I became a travel writer, after I studied hotel management, then I did a diploma in photography and another one in film making. I have work in a production of an ecotourism TV program and I write for a mayor newspaper and different magazines. I love people, I want to see the world and how they live. I love to try new food. For me traveling is about experiencing life. My websites: and (this last one I produce it with Chloe to show the world all the attractions of this magnificent city). Well, is independent and uniq, must of the apartments in the city are in buildings no gardens no yards and no good lighting. This apartment is located in a condominium with only 4 houses, lots of windows and good lighting and I can share my garden with you, we can have a good conversations with coffee or tea. 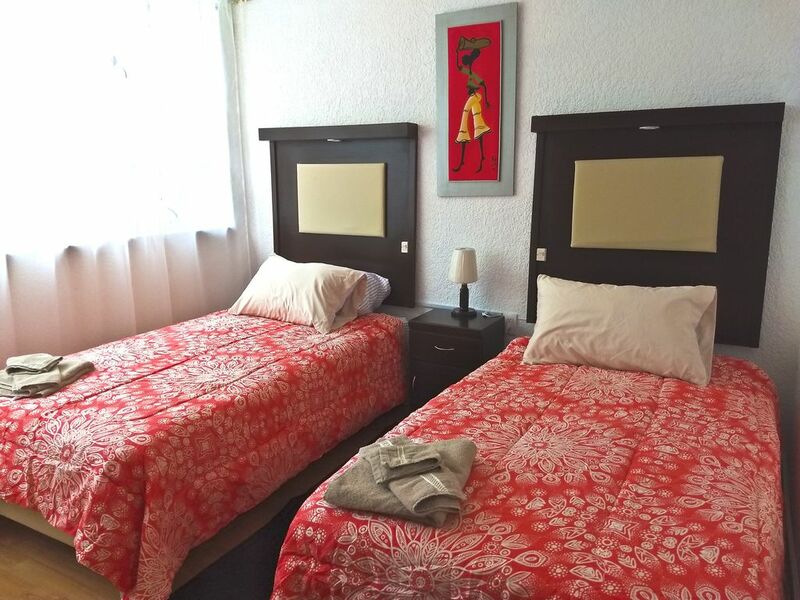 Also is in the geographical center of the city, you can get any where within 45 minutes, and we are close to Insurgentes Avenue which crosses the whole city from south to north, and there you can hope in to the metrobus towards, Zona Rosa or towards UNAM. We are one block away from Coyoacán Av. where you can take a public bus to Coyoacan neighborhood, An you can walk to the metro station that will take you to Centro Historico. I was born in this city, so I know it by heart, I have international friends coming here since 1991, I know all the highlights and the right places to go. As a travel & food writer I know some inside tips and I know where you can get the best tacos or which museum you can't miss, the right hour to go to Xochimilco. Besides that the house is really comfortable and has all you may need during your stay in Mexico. Also I'll be happy to take you to the supermarket with me to buy some groceries, when available or if its on my way I can give you a lift and if I'm going to a function or event worth seeing I'll let you know. The half barh room is behind the kitchen, it use to be a service badroom. It's not spacious and the shower is near the toilet, it's clean and it works perfectly. We are in the center of town, we are not the historical distric but we are near to must attractions, esay to get here and walking distance to the public transportation metro and metrobus. I provide linens and blankets. You'll have your own laundry room with space to hang clothing and a washing machine. Parking is not included, you need to pay a nightly fee for parking, you must request it on advance. I'll provide 4 set of towells, which include make up towel, hand towel, bad room towel. I also include towel for the kitchen and other to clean the flor. It's an 18 feet refrigerator, plenty of room for your groceries. It has a water conteiner in case you want to cool some water for your stay. It's a small stove, with 4 burners, you need a lighter tu turn it on. One is provided for you to use. This coffee maker is for 10 cups, I'll provide some coffee. At list for the begining of your stay. The coffee I chose is a mexican very high quality coffee. I'll provide toilet paper, sugar, salt and coffee. Napkins and paper tawells. This Items should last you 3 or 4 days. All the dishes and utensils you may need for 6 people. You'll have your own kitchen with all the appliances you may need for your stay. You'll have your own private dinning area. It seats 6 people. One 43 inches smart tv, for the moment we don't have cable, but you can acces Netflix, Hulu and HBO. There is a small stereo. I have some books in English and Spanish that I'll be happy to lend. We have a lawn or garden that occasionally will share with guest, if you see the door open please come and enjoy. We have big yard or patio, which is also part of the parking area. We can help you get food deliver. We also have home made meals deliver. Just ask. We are 10 minutes away from the WTC, where they have expos almost every week, we are very close to Coyoacán where you can visit Frida Kahlo blue house and see the beautiful architecture of the cathedral and other beautiful buildings. There are restaurants and coffee places one block away, you can visit the traditional markets also one block away. Fonda Margarita one of Anthony Bourdain favorite traditional restaurants is only 2 blocks away. I can help you plan your visit and take advantage of every minute of your stay.